Sorry this event has now expired. But please check out other great events from the best of Solihull. 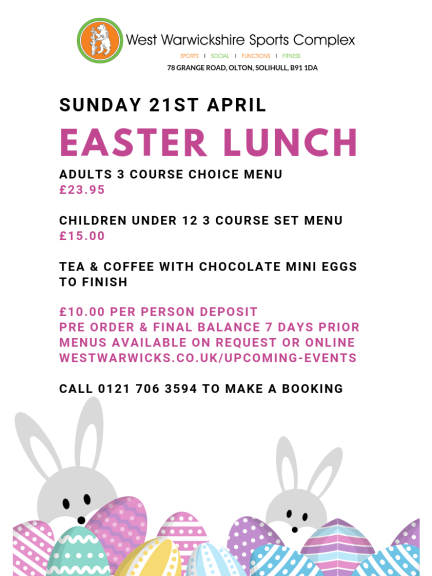 Easter 3 Course Sunday Lunch at West Warwicks, Solihull. Join us this Easter, 21st April, for Sunday Lunch! We will be serving lunch from 12:00pm, with last orders being 5:30pm. Bring the whole family along for a lovely event. We will be offering a 3 course Sunday Lunch menu, to include mini eggs at the end of your meal. We will require a pre order for all tables at least 7 days in advance. A £10.00 per person non refundable deposit is required for all bookings. Call 0121 706 3594 to book your table today!